The Dark Knight Rises (2012), directed by Christopher Nolan is the third and final installment in Nolan's Batman movie trilogy. It is a sequel to Batman Begins (2005) and The Dark Knight (2008). Synopsis: Batman / Bruce Wayne (Christian Bale) took the blame for Harvey Dent's crimes in The Dark Knight, leaving him with a tarnished reputation and making him Gotham City's enemy. After spending eight years in hiatus, he resurfaces to save the city when a new terrorist leader, Bane (Tom Hardy) comes and brings destruction. Everyone has watched this movie, am I right? I'm not a fan of Batman but after watching The Dark Knight in 2008 and remembering The Joker, I know I should watch this last movie of the trilogy. The cast is a very strong one with many reprising their previous roles. Christian Bale as Batman / Bruce Wayne; Michael Caine as Alfred; Gary Oldman as Commissioner James Gordon; and Morgan Freeman as Lucius Fox. Old is gold. All of them are great! The girls are great too with Anne Hathaway as Selina Kyle and Marion Cotillard as Miranda Tate. Hot! On a lighter note, I saw the following strip about "'The Dark Knight Rises' an 'Inception' Reunion" on the Internet a while ago. Now that's really funny. It's like watching Nolan's Inception all over again, minus Leonardo DiCaprio. 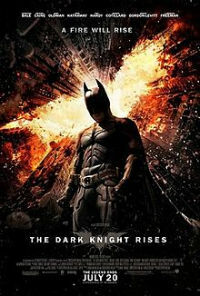 Well, since The Dark Knight Rises is touted as a dazzling Batman finale, you should watch it too.